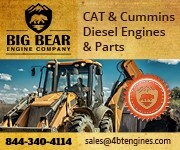 Sellers are charged to list their Diesel Engines and Spare Parts. Charges are made in arrears. At the start of each month, your charge is calculated for the previous month based on the number of listings that you had during that month and this is processed to your credit card. In order to ensure that DieselEngineTrader.com is a useful resource for both buyers and sellers, we have listing rules. 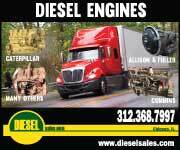 If you want to listing diesel engines or spare parts then you must follow them. We have two types of banner ad on our site. The first is a fixed banner ad that appears on the right hand side of every page. See the right hand side of this page. The second is a rotating banner ad that appears at the top and bottom of most pages in rotation with other banner ads. See above and below. You should complete the Contact the Seller form on the engine or spare parts details page for any questions or quote requests relating to that listing. If you have a question regarding this website then try reading our FAQs first. If your question is still unanswered or your have other comments then please contact us. Read our Frequently Asked Questions section has answers to all the most common questions that we receive. If you do not find the answer you are looking for then feel free to contact us. We respect the privacy of our customers and their data.